What would you sacrifice to protect your country, your family, and your friends? What would you do if you couldn’t protect all of them? I very much loved the cast of characters in this book, particularly the all-female magic airforce unit. It reminded me a great deal of history I’ve read–for example, the US Army Nurse’s Corps during WWII. (At first the army thoughtfully provided the nurses with lipstick in their issued gear but not with sanitary napkins or helmets.) Women have always fought, but often they’ve had to make do with using leftover equipment, being ignored, or worse, actively sabotaged. I enjoyed cheering for the 146th Night Raiders as they struggled against the odds, even while the book deftly wove in discomfort with the nature of the war that the girls were fighting. Military fantasy and sci-fi always runs the risk of glorifying war and conflict and oversimplifying the dreadful choices that those involved in war must make. I thought We Rule The Night handled this awful ambivalence with great sensitivity and deftness– as a reader I was still solidly hoping that the girls would come out victorious, even as I was sharing their dismay about the war’s cost in lives and innocence. girls who engage in fisticuffs! girls who embroider things ON their cuffs! I love airplanes–it was one of the highlights of Captain Marvel for me to try to figure out which actual aircraft they used as inspiration for Carol’s rides–but I was surprised by how attached I got to the living metal planes in this book. I won’t spoil anything about them, but I felt like Linné and Revna’s plane was a character in her own right, and that’s some darn fine storytelling right there. 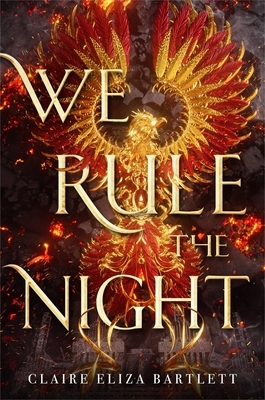 We Rule The Night comes out on April 2–that’s only two more days!! You can order it from Indiebound or Amazon. I recommend the book for anyone who enjoys tea, hanging out with amazing women, Chapter Titles That Would Make Great Tattoos, crying about airplanes, and suddenly wondering whether the cats might be reporting your conversation to the Union.